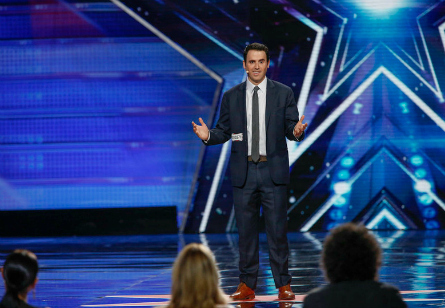 More auditions from Hollywood inside the Dolby Theatre were underway for “America’s Got Talent” season 10 week 5. 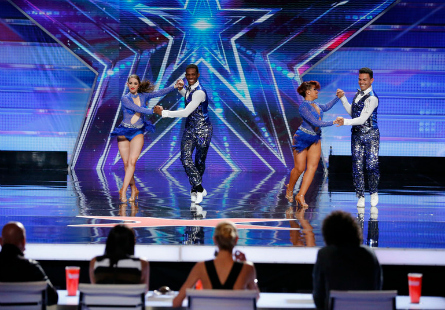 Host Nick Cannon explained that the “Golden Buzzer” is in play this season to send an act straight to the live shows at Radio City Music Hall. Each judge is allowed to use the buzzer only once per the entire season. The judge left who hasn’t used their Golden Buzzer yet is Heidi. One act inspired her to use it in this episode. She’s a 24 year old singer who grew-up in a very small town in Alabama with only one stop sign. She said she always sang in her bedroom and has stage fright. 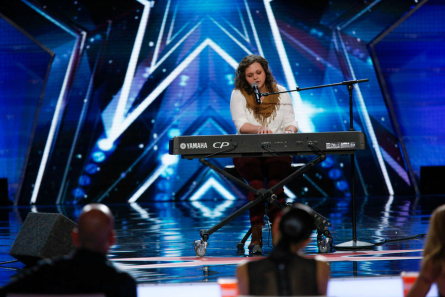 She sang while playing the piano, but was so nervous that when she messed-up the judges asked her to start again. After she got through it, she was crying and the judges told her “don’t cry.” Howard said she is “amazingly talented” and the lesson learned is “to never give up.” Mel B. told her she is “so sweet and immediately likable” and wants her to succeed. Heidi said she deserves a shot to be there although there were a few hiccups. Howard told her the truth that she does have talent but doesn’t think it’s enough to compete in the show. Howie thinks she was just nervous and voted “yes”, as well as Heidi also voted “yes.” She only need a “yes” from Mel B., who did give her that vote. The animal acts included “Einstein the talking Parrot” whose talent was sound effects, then Rascal who is the first ever doggie strip show who got X’d, then a supposed “hyper-active” turtle who proved to be anything but when her owner couldn’t motivate the turtle to go through an obstacle course by feeding her strawberries. 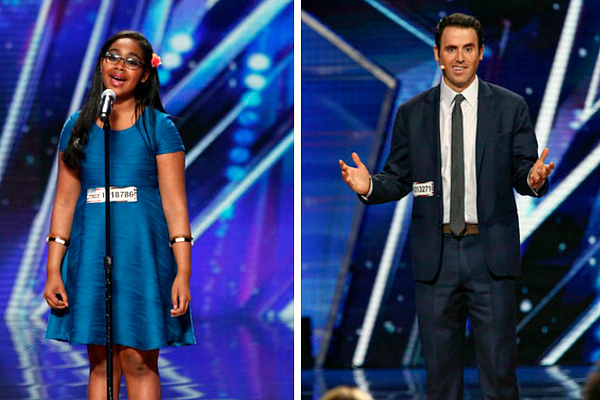 After getting four X’s, Howie told her she has to come out of her shell! 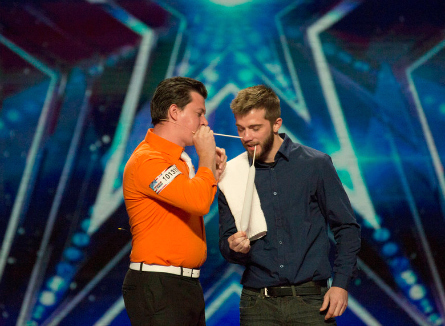 The perfect transition was a bird whistler who auditioned next. After the animal acts was 57 year old “Byrdie” Sue who does bird whistles. People on her cruise encouraged her to audition for AGT. Howard said she’s on the edge of “bad”and she’s “So bad she’s good” and called her very entertaining. 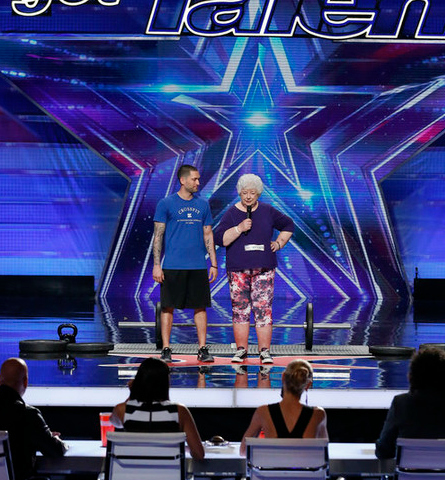 Heidi said she’s sweet, “but not really for America’s Got Talent.” Howie told her to keep whistling while she works. “Mr. Fudge” is the act that made Heidi “so grossed=out” she forgot to buzz. Pictured: Heidi reacts to “Mr. Fudge” act. 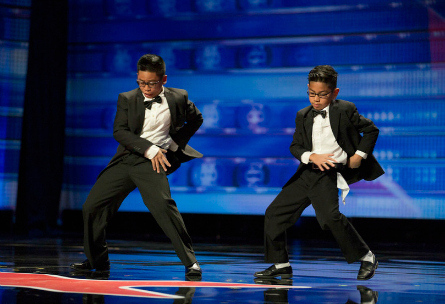 These kids want to bring tap back. Howie called it innovative and the kind of thing that they are excited by. They were painted and in suites as they danced in an abstract way. 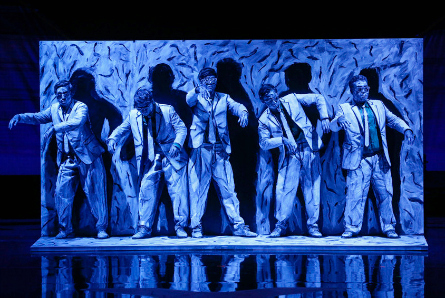 Mel B. said it was like watching a piece of painting come to life. They described the sound of their band as “metal mariachi”. 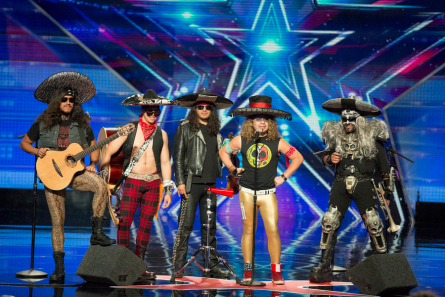 They sang a mariachi style of “We’re Not Gonna Take It” by Twisted Sister and got “yes” votes from all the judges. NEXT up were kid dancers who ranged from tap, to a dancer on a bicycle, and ballet. Airel said she got into singing because her brother would sing, so she’d imitate him. One day he told her she should sing for real. Airel auditioned with an Opera song and sang it so beautifully. Heidi said she thought that Airel was singing play back because she sounded grown-up. Mel B. couldn’t believe that such a huge voice came out of her. Howard called it “a very special moment” and it was “freaky,” stating the “overall effect was quite astounding and Amazing.” Howie called her adorable and wants to see a lot more of her. 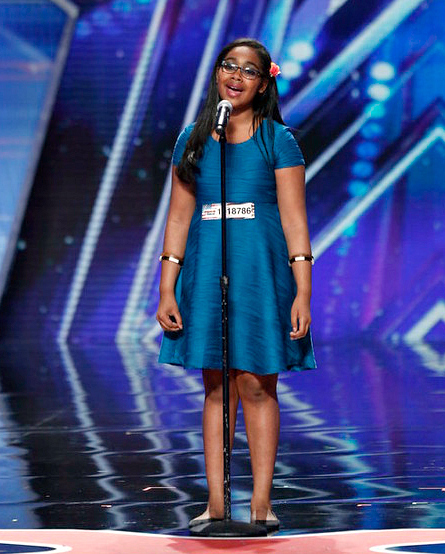 Heidi used her Golden Buzzer on her to send her straight to Radio City Music Hall. All of the judges have now officially used their Golden Buzzer option! A “power-lifting granny” who could bench 280 lbs. The judges said it’s not right for the show, but glad they saw her. He does dangerous stunts and says with the chainsaw that he brought today is the first time he’s tried the stunt and could die. 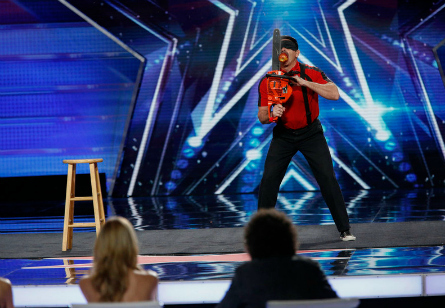 He held an apple in his mouth blindfolded while he cut the apple in half with the chainsaw. He got a standing ovation and Howard said it was either the stupidest thing he’s ever saw or the most brilliant and needs more time to process it. Mel B. said she couldn’t feel the danger and voted “no.” The other judges disagreed with Mel. Howard thought it was intriguing. Heidi’s worry for his safety made her almost say “no”, but decided to say “yes” which was the vote that he needed to go through. Olesksiy is from he Ukraine and said he needed a partner, but not a real one so he doesn’t have to have her complain. His act is called “Dolls Love”. The dress on the mannequin is his wife’s wedding dress. Heidi and Howard said “strange but good”. Howard said he can see why his wife is jealous. Heidi said it was “amazingly good” even though it looked weird with him climbing over the doll, but she gets it because he can show different positions (everyone laughed). “You are a powerhouse”, said Mel B. Howard asked Howie if he can imagine the different outfits on the mannequin. Alex said it’s his dream to have his own show in Vegas. He sang with a large band who performed Taylor Swift’s “Shake it Off”. He got a standing ovation from the audience and Howie and Heidi. Howie said in his six years, it was the best music act ever. Mel B. said he filled the whole room with his energy. Heidi called it contagious and loved the style of the band. Howard said he could watch it all day and called him an incredible dancer when he did the splits. Alex was crying tears of joy and thanked the judges for giving him a chance. 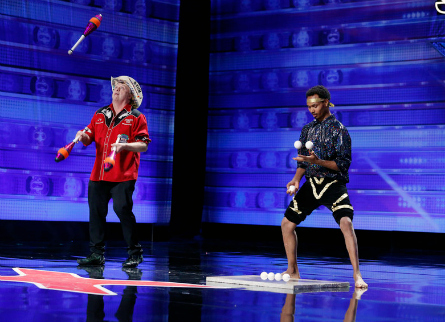 They are taxi cab drivers in Las Vegas who met a year ago and they both juggle. 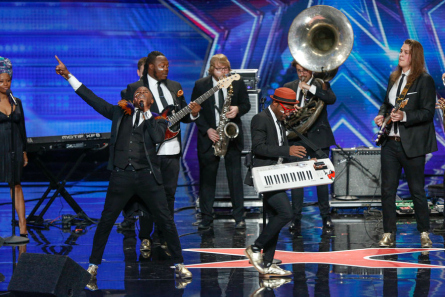 After their audition, Howard said, “I don’t think you knew what each other was doing. “It’s crazy stuff.” Mel B. was the only one who didn’t hit her X. She said it was because she loved the song. Heidi said it was a hot mess, and they gave-up in between. They only got one “yes” and it was from Mel B for song choice. Howard pronounced them “finished”. NEXT WEEK: More danger acts and someone lights themselves on fire!